CIT Group is apparently in trouble and now negotiating with Treasury, the Fed, and the FDIC for some sort of “bailout”, e.g., in the form of a guarantee for its debt. Traditionally, CIT provided vanilla loans to small and medium-sized business. “But under its current chief executive, Jeffrey M. Peek, a well-liked Wall Street veteran who lost out several years ago in a race to run Merrill Lynch, CIT made an ill-timed expansion into sub-prime mortgage and student lending” (NYT today). At the end of 2008, CIT had total assets around $80bn, which was about 1/10th the size of Goldman (and about 1/25th the size of Citigroup) and puts it just outside the top 20 publicly traded financial services company. Presumably, it just missed the cut for inclusion in the government’s recent “stress tests”. Its assets are between 2 and 3 times those of the largest “hedge funds” – although obviously what gets that label these days is somewhat arbitrary, and the leverage in any individual fund could mean system risks roughly of the same scale as for CIT. CIT’s bailout possibilities are now in the realm of political choice. The rest of the financial sector, including hedge funds and the American Bankers’ Association (ABA), should be lobbying for it not to get bailed out – otherwise the bar for “too big to fail” will be lowered (by roughly an order of magnitude), and there will be many more voices arguing that even medium-sized banks/funds need to be broken up or otherwise severely constrained. However, given that hedge funds have no discernible political strategy – other than to cry in public about impending European regulation – we should not expect any coherent response from that quarter. And the ABA mistakenly thinks they can take on all comers on all issues; their hubris does not lend itself to thinking through this particular part of the chess game. So both of these powerful forces are likely to sit on the fence. The decision therefore largely comes down to the administration. On this front, the lack of strong connections between CIT’s CEO and senior Treasury officials looks like a weakness. CIT seems to sit at the edge of the charmed circle, with regard to meetings, shared social engagements, and intellectual entanglements. This is a close call, but I think it is just on the outside of the circle – in the sense that with the overall financial market situation more stable, the GM bankruptcy well-managed relative to expectations, and other credit support programs still in place, the balance of official opinion will tilt against CIT. So then it all comes down to political donations. At least in terms of what is in the public record, Mr. Peek has not been overly generous, but he did give money to John McCain – and not to any Democrats. If this is in fact the limit of his recent contributions, I think you know the outcome. This entry was posted in Commentary and tagged CIT, Jeffrey Peek. Bookmark the permalink. Enough with the “only the correctly politically connected get bailed out”. Bail out CIT…they bailed GE Cap. Bail them all, or let them all die, no political favoritism, or the inevitable vengeful paybacks will be uglier than the current mess. Personally, at this juncture, I say bail them out. We are already so deep into this abyss of deficit…and have already conceived the climax of our governments mismanagement…lets bail out everyone and enjoy the party as long as we can. So the Administration can let CIT fail and risk a market backlash, or they can bail them out and risk… what, exactly? Is there any evidence that bail-outs carry any political price whatsoever? CIT will not go bankrupt. “The Failed Promise of Innovation in the U.S.” by Michael Mandel. It basically argues that the present recession/depression could be chalked up to a lack of innovation in the past decade. I think it’s an interesting thesis. Great. So now we know exactly what “healthy” means: Politically wired. Good to know. Some day somebody’s going to set up some sort of index fund based on campaign contributions…. Sort of a “Non-Random Walk Down K Street,” if you see what I mean. First, to a broad swatch of the economy, CIT is more systemically important than Lehman was. Of course, it is a swath of economic activity with which policy mandarins have very litle interaction. CIT’s customers are mid-sized manufacturers and various kinds of wholesalers, retailers, distibutors, etc. If you can protect those enterprises from the collapse of a source of financing critical to them (at a time when mostof them aren’t bankable as new business), then by all means let CIT go. Second, the way you’ve set up the alternative outcomes, each validates your contention that at this point government intervention into economic arrangements is exclusively about interest group politics (oligarchic corruption, of you will). If both outcomes can validate your contention, then neither really does, and it all becomes a bit like astrology. I’d be surprised if it happened. The fact that CIT’s executives have not bought the administration like others have before them does not preclude CIT from receiving a bailout. CIT’s failure could be a major PR problem for Obama. According to the WSJ, CIT has close to $9 billion of unsecured balances associated with its small business clients from services such as factoring. This is such a small dollar figure in the grand scheme of this crisis and the financial assistance that other firms have required, but if a bunch of small businesses are pushed over the edge and can’t pay suppliers… It would hardly be the end of the world, but it does make for a long parade of tragedies in the media. Weigh that against Nemo’s observation above that there has been no demonstrable political consequences for bailing out financial firms, and I’d say a CIT BK would be unlikely. I’m STRONGLY against a bailout for CIT Group. They’ve already set a horrible precedent. We’re not in the same situation we were few a months ago where we’re afraid the whole system will collapse overnight. Let CIT file bankruptcy. Let them fail miserably and face the wrath of the market. Let the FDIC take the assets them and resell them to small and regional banks that know how to run a damned balance sheet. There is a paper written by some people at the Federal Reserve Bank of Minneapolis titled “What Should We Learn From the Great Depressions of the 20th Century”. It’s an excellent paper written in layman’s language explaining why rewarding irresponsible behavior by bank leaders will only bring us 10 years of economic stagnancy similar to what Mexico suffered in the 80s and Japan suffered in the 90s. If we “bailout” CIT Group we are going down a long, long, long, slippery slope (if we’re not already there). Let CIT Group file bankruptcy and let the FDIC clean up their mess. Here is the paper to view or download if you want. CIT’s best argument is that it is “too niche to fail.” Probably it should be let go. Some Goldman venture will pick up the pieces and make a lot of money on wider spreads to main street lending. If WH lets CIT fail, she’s gonna wish she was a TARP Wife. We had innovation. It was in finance. That’s where the market, via wage signals, allocated our best and brightest. I cannot possibly fathom what you might be arguing. Of course, CIT should go under. And they will because unlike Goldman Sachs, they haven’t paid their dues. The only downside is when financial firms conclude that their survival depends on bankrolling Obama’s re-election campaign. How will we bailout democracy when that happens? It entirely depends what you mean by bailout – the choice is not bimodal. I’d suspect that the most likely scenario is for the WH to push hard to find a buyer, and potentially give that buyer a very lucrative offer (e.g. long term low-rate non-recourse loan). Is that a bailout? On the one hand, it wouldn’t touch the people who actively use the bank (who arguably should not suffer, particularly if they’ve been using the bank prior to the changes that turned it risky). But, it could kick all the management out if done properly. WH right now has a huge political incentive NOT to bail out any more banks… WH approval has taken a hit in the last month (and bailing out banks is easy fodder – it’s one of the least popular causes one can imagine). CIT is this fall’s Bear Stearns. I meant Lehman Bros – ooops. And to think the Fed/Treasury was just planning its bailout interventionist exit strategy (yeah, right!). Watch – a “non-bailout” strategy will be tried on CIT and it will blow up and EVERYTHING WILL BE BLAMED ON NON-BAILOUT. That should scare up more support for other rounds of bailouts,rule manipulations, etc. And who will question Owebama? The problem I have with letting them go bankrupt would be if their assets get bought by any of the major TARP recipients, which seems like a better than even chance. If the result of the past year is just to allow the big guys to get bigger at the expense of the middle tier players then we are setting up the conditions for a worse problem in x number of years (of course considering JP Morgan/Bear/WaMU BofA/Countrywide/Merril and Wells/Wachovia I guess we are already there). I don’t see any hint or even a whiff of a proposal in Congress to break up the mega banks and in my mind that is the only possible way to reduce the chances of near term recurrence of these same problems with worse results next time. Of course bail them out and it continues an awful precedent. My money is that they will let them go bankrupt and have a buyer in the wings but I see plenty of logic in Bond Girl and Nemo’s arguments as well. Sooner or later we need to be prepared to end the immunity from bankruptcy that has been granted to every financial services firm. This dance wherein a financial firm on the edge produces some memo claiming dire circumstances if it should die is absurd; every bankruptcy has external impacts. Enron was a far bigger risk, and its demise killed Andersen, but live by the sword, die by the sword. CIT does not have deposits. Its investors explicitly undertook risk in providing it capital. Its assets are worth what they are worth; the debate in bankruptcy is how they are parceled out among the claimants. Let’s see that process. They should be bailed out. It’s too early to test Moral Hazard again. On the other hand, there do seem to be more palatable options than in other cases. Still, I suggest playing it safe. But I’m still worried about Deflation. Here’s a key difference: I would suggest it is never too early, and that creating a “too early” category encourages the very sort of lemming behavior that got us into this mess. Companies that are unable to pay their debts – whether due to short-term liquidity crunches (eg Goldman Sachs in the back half of September) or structural solvency problems (AIG) – are supposed to go bankrupt. There is nothing wrong with this outcome; stocks are not meant to go up or down, but rather to reflect the value of the underlying equity, which at a point in time may be zero. It is not the government’s role to protect investors or creditors from the consequences of their investment decisions (it is, by contrast, the government’s role to protect against fraud). The investors and creditors of CIT are big boys. If their instruments had been successful, they would not have cut the government some bonus check on top of their taxes on the grounds that they made too much money. Well, this is the risk they took. From the GSEs on, private companies need to be allowed to have private failures. It is a bedrock principle of not wasting taxpayer money. If they are even discussing it, guaranteed, it will happen. If CIT is propped up, there is no end to the zombie economy. CIT has a $3 billion line of credit with Goldman Sachs, of which approx half has been drawn. For that reason alone, they will be bailed out. This is just one reason that Debt-Deflation is so scary. Job loss can vastly outpace the decline in GDP. The govt sitting by while this continues isn’t realistic. I don’t see the only two options as “sitting by” and supporting current stock and credit holders of financial institutions. Let’s take an obvious case: the US has a terrible transportation network, both for people and electrons. Our bridges are old and prone to collapse, it takes about as long to move along the Boston-Washington corridor as it did fifty years ago, and cities all over the country are prone to brownouts/blackouts. If we had pumped hundreds of billions of dollars into this largely public infrastructure, the taxpayer would have come away with something: better public services. By contrast, pumping billions of dollars into AIG so Goldman and SocGen could be paid out at par created nothing for the taxpayer – not even additional claims upon Goldman and SocGen, the true beneficiaries of the intervention. One of two things will happen with CIT: (a) the government will absorb the losses incurred by the fall in the value of the company’s assets; (b) the creditors and shareholders of CIT will absorb the losses incurred by the fall in the value of the company’s assets. I would prefer (b). If the consequence of (b) is that one or more creditors or shareholders themselves go bankrupt, so be it. There is no reason the government’s attempt to set a sound economic policy for the future needs to allocate resources to absolve certain market participants from the consequences of their past actions. But that is only because they are tired of hearing about how bankers now have to share yachts. This one can be spun either way, but I’m sure the NYT business section will focus on the family business that imploded because it had an accounts receivable financing arrangement with CIT. I’d let it go myself, but then again my legacy does not hinge on re-election. I agree, which is why I think they will try a middle ground. And arguably the right thing _is_ a compromise. 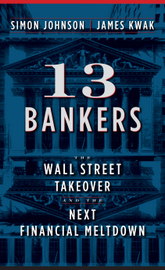 If we think that the bad incentives primarily have corrupted bank management, and the hierarchy of blame rests on management, then shareholders, then bondholders… Then a govt-backed firesale that ejects mgmt, pays shareholders some fraction of the share value (which may already be priced in), and keeps bondholders _mostly_ whole would be both the least politically costly thing to do, and a reasonably fair/efficeint thing to do. For all the mistakes Team Obama has made, they have 7+ more years of totally catastrophic policy-making before I blame them as much as I blame the previous administration. And I do mean _totally_ catastrophic. why not try nationalizing CIT, as a test case? hmmmm, notice that bank nationalization has fallen off _everyone_’s radar. Their collapse will not trigger an end of the world financial catastrophe, but it sure will help push the unemployment rate much higher than it currently is. That may be a factor influencing the govt. decision. i’m surprised that they couldn’t get FDIC to insure their debt. that plus TARP would have solved their problems (at a fairly low cost to taxpayers, especially when compared to a bk) and we wouldn’t be hearing about it. so their balance sheet must be in really bad shape. What do you mean, “when”? Black Swan, thanks for the links and reference to Richard Florida. I have been wishing something similar. StatsGuy, there was so-called financial innovation in the past decade. But there needs to be real innovation for a real economy in the decade coming. That is the challenge. And this innovation does not have to be in the financial sector. Some say it should be innovation to deal with climate change. I believe I read in one of Simon’s slide shows 41% of American economic growth was in the financial sector. Financial products were packaged and repackaged many times over with fees attached to create the illusion of economic growth. Lloyd says Goldman’s exposure to CIT is not material. By which he means he has bets against it too, and stands to gain no matter what happens. Regarding “connectivity” to the plutocracy, I can only imagine now that they rue decisions not to be more generous in assisting with more campaign financing, but company’s like CIT and HFC, which, while large, are “fringe” participants in the big boy financial community. I suggest that they not be bailed out, but that is in keeping with how I felt about most, if not all, of the TARP response to potential bank failures. The worry in not bailing them out is the potential greater domino effect of further weakening an already limping financial sector. But, on the other hand, maybe it’s high time that we hit real bottom, wherever that really is, so that we can start afresh. Time to bring the entire finance engine in line with the rest of the economy. There is real linkage with consumer confidence, abuse of credit (as in borrowing on CIT’s far less than generous terms – and they are very ugly, since they lend to the marginally credit-worthy as a principal clientele), and the health of the financial sector. Let’s face it, a very large portion of the borrowing public, both consumers and businesses, either don’t want to, or can’t qualify to borrow. It’s high time for the administration to find their way to reality in the bailout game, and put away TARP as a reasonably failed real remedy, and get on with letting the economy actually happen and adjust. AT WHAT POINT WILL THE FINANCIAL SECTOR BE HEALTHY ENOUGH TO ASSUME RESPONSIBILITY FOR ITS OWN ACTIONS? It’s literally absurd to point to the health of Goldman as leading indicator that the sector’s on its way back, when the feds supposedly need to prop up yet another financial institution. Who’s next after CIT? The amount of money being sucked out of the economy into the black hole of Wall Street seems infinitely large and rather damaging to the rest of the economy. If only I were a bank, and my business could be propped up by an endless supply of federal revenue…. CIT is not really about Wall Street. Great comment, what does it matter the problem is the system. But if we arent going to do anything about fraud, corrupt regulators, and hella government debt. Why make it hurt more than it has to. In the same vein if contracts are so cheap and poorly written by asset managers. Well why all the leg up on the economy when its NOT even the banks money OR risk. We need a radical change back to capitalism and in my opinion if a CIT bailout is step 1, step 2 should be just as full of possibilities like getting real real with the banks over this. give me wal mart banking over this crap, at least i can get a fair deal and never hear the world goldman sachs again. Obviously, CIT isn’t having a solvency problem. Just a liquidity problem. It’s a crisis of confidence, not competence. Plain as day. I don’t know whether or not CIT should be bailed out. But I wonder if letting it fail means we’ve thoroughly institutionalized “too-big-to-fail” into the system. To earn the big bucks, you’ve got to have the size to engage in the risk and become big enough to insure you’ll bet bailed out when the risks don’t pan out. Stats Guy is right, though. We sent our best mathematical minds, who could have been gainfully employed elsewhere in the economy, on a hopeless mission to eliminate the risk posed by human market interaction. One has to think that getting them out of the casino and back to work would be a good thing. But as long as the dice are loaded and they’re still cashing in, there’s not much hope of this. This was the comment I wanted to leave, but you said it much better than I would have. Or will gain more from a bailout of CIT, in which case Goldman will get paid twice; first, as its bad trades are rescued by taxpayers, and then again as gains on its hedges on those trades are realized. I spent an hour tonight ripping Goldman here if you want to check it out. Overall financial innovation have significantly improved overall market efficiency. However, like most powerful new technologies, we’ll need to iteratively improve the implementation to work out all the bugs. As a non-economist, it seems to me part of the solution is simple. Tax reform. America needs to close the wage gap between the very rich and very poor. (IMHO, ridiculous, for one person to make $100 million in one year.) Social and economic comes from a widespread middle class. Michael Sandel points out that “the faith that markets are the primary instrument for achieving public good” has failed. It is music to my ears when he calls for a re-examination of “civic life”. At a certain level it resonates. It is something people hunger for. I’ll add here the top 1% in reality would not feel any burden from a 50% income tax. (Although, I don’t know what the top tax bracket is in the United States). CIT should be bailed out. They have the same right as GS or AIG. Just because they are small and are not a threat to the economy they don’t deserve the same treatment? They are not speculating with the market, they just earn money by lending to firms that need capital to grow. They play an important role in the mid-size economy. If the problem is shortage of cash, just give them a loan or a guarantee of a debt issuance and that’s it. They will continue to be profitable as when their stock was traded at 65 dollars.